Italians call a meaty sauce that’s been simmered all day a “gravy”. This one is made with the addition of country pork ribs, sausage, and veal – which I leave out (I just can’t get past the baby cow thing). Now, if you’ve never added pork to your red sauce – with all due respect, but you’ve sorely been missing out. It adds such a wonderful richness and complexity that is unparalleled. Sausage is great, but the pork ribs are really where it’s at. 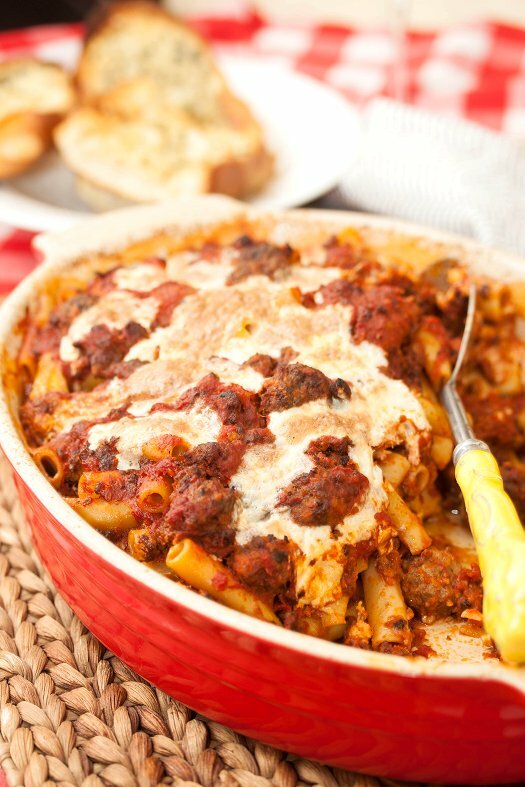 It’s wonderful simply tossed with pasta, or if you want to doll it up even more you can add mozzarella cheese and mini-meatballs to make Ziti al Forno. No matter what you do with it, you can’t go wrong with this sauce. It’s really a staple. Do yourself a favor and make it soon, you won’t regret it! Bada-bing. To make the sauce, heat the oil in a large heavy pot over medium heat. Pat the pork dry, season with salt and pepper, and place the pieces in the pot. Cook turning occasionally, for about 10 minutes or until nicely browned on all sides. Transfer pork to a plate. Place the sausages in the pot and brown on all sides. Set the sausages aside with the pork. Drain off most of the rendered fat from the pot. Add the garlic and cook for about 2 minutes or until golden. Remove and discard the garlic. Stir in the tomato paste and cook for 1 minute until starting to brown. Using clean hands, gently squeeze the tomatoes to break them down slightly, and add to the pot (along with the tomato juices). Add the water; and salt and pepper to taste. Add the pork, sausages, and basil and bring the sauce to a simmer. Partially cover the pot and cook over low heat, stirring occasionally, for 2 hours. If the sauce becomes too thick, add a little more water. Meanwhile, make the meatballs: Combine all the ingredients except the oil in a large bowl. Mix together thoroughly. Rinse your hands with cool water and lightly shape the mixture into 3/4 inch balls. Heat the oil in a large heavy skillet. Add the meatballs and brown them well on all sides. They will finish cooking in the sauce. Transfer the meatballs to a plate. To serve, remove the meats from the sauce and set aside. Toss the cooked pasta with the sauce. I have this cookbook and have made this Sunday Gravy, but not for many years. Thanks for the reminder! And I remember some other good recipes in there, too. I’ll need to go dig it out and try something new. This recipe is amazing; I’ve been making this for years and always play Italian opera, wear a chef’s hat and apron while making this. Dorky? Yes, indeed, but it is my tradition. When the opera goes on, my husband knows what’s to come. If there was ever a reason to uncork a bottle of wine and completely dirty up the kitchen, THIS IS IT! Your diners will be floored and your house will smell like you are hiding and Italian grandmother somewhere. MAKE THIS! Thanks for that input, John. I’m just calling it what they called it in the show (also, referred to as gravy in Goodfellas). I mean no offense, but go scratch.